The Leadership Bismarck-Mandan Committee works to develop local leaders who actively participate in and support community progress. 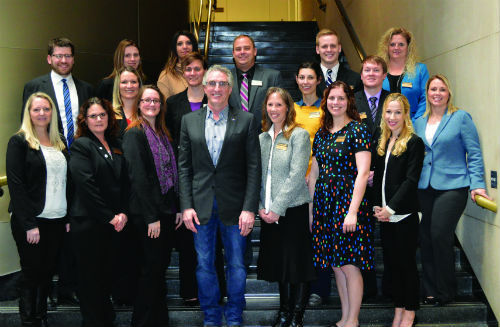 Mission: Leadership Bismarck-Mandan engages emerging leaders in business and community issues. Download and fill out the Leadership Bismarck-Mandan Application Form. When finished, click "Submit Form" to return the completed form. You can save data typed into this form. One letter of reference from your supervisor is required. Have your direct supervisor download and fill out the Leadership Applicant's Supervisor Referral. When finished, click "Submit Form" to return the completed form. You can save data typed into this form. Deadline for application and letter of reference is August 1. The Leadership Bismarck-Mandan Alumni Association (LBMAA) is made up of graduates from the Chamber EDC’s Leadership Program. This program has been in existence for nearly 20 years with the goal to improve our communities through our collective leadership efforts. LBMAA expands on the Leadership Program by offering continued training, volunteer, and networking opportunities to its members. We are active in Chamber activities, serve on the boards and committees of many nonprofit organizations, and volunteer in numerous roles. If you wish to pay your membership dues online, please click here. To learn more about LBMAA, please visit lbmaa.org.